I haven't found a weakness other than underpowering, you can over power all day and they take the abuse as long as it's clean power! AWESOME! is all I can say about the VS-150's. You definitely need to feed them at least 150 watts to get the best sound. They will play very well with a smaller amp but the more power the better. I am using a Kenwood KR-9600 which puts out 160 watts per chanel and they sound great even at low volumes. I hear all the people who love KLIPSCH talk about the tweeters not being very clear and that these are basicly a garage, party speaker. I couldnt disagree more. I own a pair of KLIPSCH Heresy, and KLIPSCH KG 4'S. The Cerwin Vega VS 150's stack up to these and put out a fantastic sound. The BASS is awesome and no sub woofer is needed. My Klipsch need a sub to compliment them. I guess it is the type of music I like that makes me a big fan of the Cerwin Vega VS 150's. I love 70's FUNK and FUNK n ROLL I call it. The CARS, DAZZ BAND, etc. anything with a good beat. Oh well that is my two cents. I highly recommend these you will not regret it. Only down side is the Cheezy cabinets. I am going to put new Maple Veneer over the top of the existing cabinets and poly them natural. Peace Out. I purchased a pair of Cerwin Vega VS150s at a garage sale. 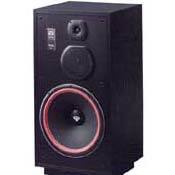 I hooked them up to my Pioneer SX-1250 and they sound good until the volume gets to about 1/3 when the Bass really kicks in all of a sudden I have these LOUD "Pop" or "snap" sounds coming out with every kick of Bass. Just so disappointed I don't know what to do. Is it the cabinets being loose although I can't see if the backs are loose or not. Is it the receiver itself? Any advice would be greatly appreciated because I can feel that Bass starting to tremble the floor and I want to just rock the f@#k right out but can't! Ugh! Help! I was lucky and picked these up at a yard sale for $10. Thought I would strip them and sell parts. Once I tested them, wow!! I have serial # 06 and 07.
and don't let them breathe when the wife is home. yet clear. Bass is fantastic but mids and highs can be overpowering also. I have a large room, about 34 by 30. I've been through 40 speaker sets and the VS-150's are keepers.! I've blasted these speakers With a techniques home Pro logic Dolby surround sound amplifier at 115 W per channel since 1997 they had never failed me diffuses only blown two times in the last 20 years these speakers rock! Cerwin Vega knows how to make a speaker! Nice sounding speakers. I've had them hooked up to a sony ta-4650 v-fet, a 70's rotel receiver (model forgotten) and a nad 3020. With all these amps rated at 40w rms or less the cerwins went very loud. They sounded pretty good too, especially on the rotel. I scored a Carver tfm-55x (500w per channel into 4ohms) and am using the nad 3020 as a pre-amp. Now these speakers are sounding awesome no matter what volume they are played at. I like to listen to all sorts of music, Cat Stevens, Skrillex, old school R&B, Eva Cassidy, Tool, and they all sound good. The extra current and amps make these things sound really good. The arrangement in my lounge is far from optimal, I am not allowed to put them where I want them because the boss won't allow it so as far as imaging, soundstage and all that stuff is concerned I can't really comment. But tonally, they sound great. I have owned B&W, and Mission speakers that I really liked but there is a fullness to the sound of these Cerwins that I really appreciate. Sometimes I like to just crank it and feel my internal organs bounce too. Btw, thanks to all the previous reviewers as I based my purchasing decision on these reviews and was definitely not let down. I will be passing these down to whichever of my kids takes me in when I get old (that way I can still listen to them).